I’ve come to realize that when I am painting I just use the same couple of brushes. Especially, since I learned that the fewer I use the more skilled I become in using them. I use one brush to paint a cloud in the sky, a window on a facade or a reflection on the water. I use the tip, then the side, then twist it around and it all makes for a bit different effect. This also makes it much quicker to use, because I just give a quick wash to the brush in between colors and I am ready to go. With that in mind I realized I have a few brushes (gulp) I have not used in a (really) long time. So I took them all out and took a good hard look at them. I have two sets of brushes which were sold in a bundle pack (for peanuts) at the crafts store and promised the ultimate experience. Some that I have inherited from a painter, and some that I have no idea where they are from. So here is a rundown of what I am facing. 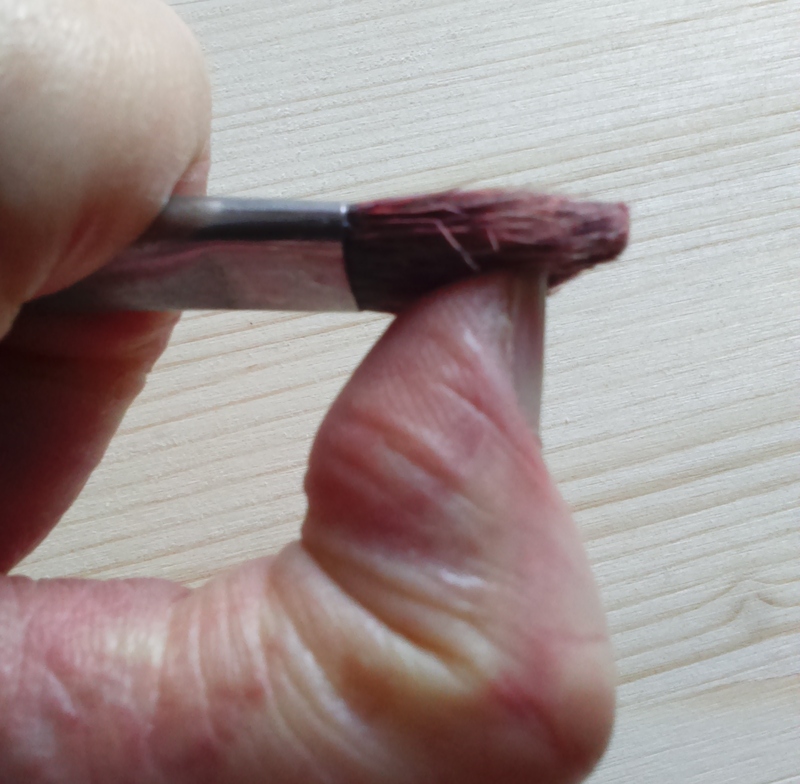 There are ones where only the ferrule hints at the original shape of the brush. 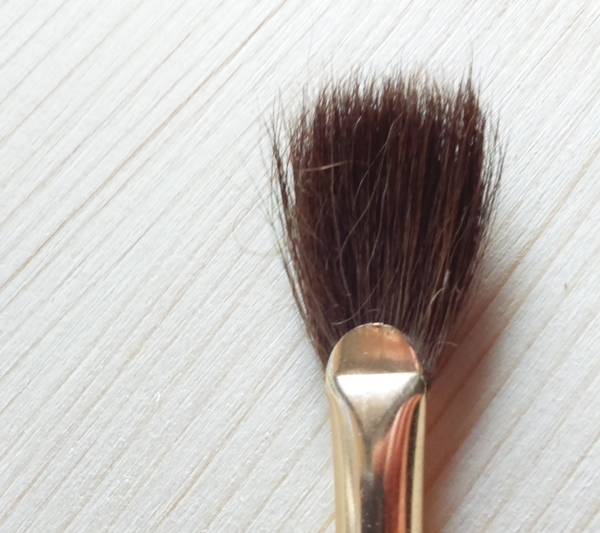 This one, for example, should be a fan brush. 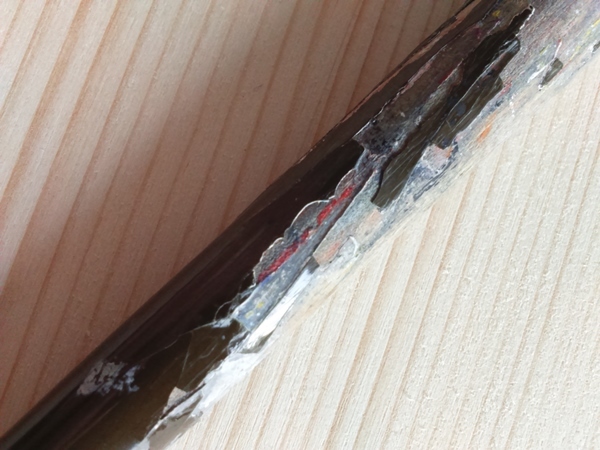 Well, this now hardly looks like a plain flat brush; one with very sparse and badly cut bristles. And don’t get me started on water retention…. 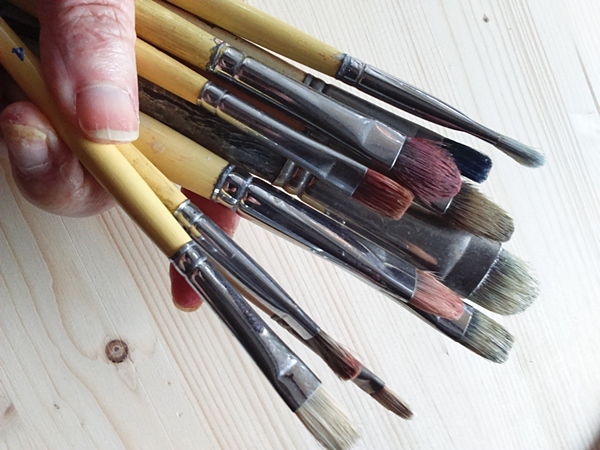 Delicate pointy watercolor brushes have become hard, crusty and misshapen with use and age. I have no idea where they came from or how this happened to them. The one on the left looks almost fluffy, but it is as stiff as if someone dunked it in hobby glue and left it to dry. Why is this still here? I have a brushe whose ferrule is as loose as a stone in a rattle. It is a miracle it is still on top of its handle. And talking about the handle, it resembles scorched earth screaming for water. Besides being uncomfortable to use, it is plain dangerous, because I could easily get a splinter in my fingers. A couple of my acrylics brushes are made of such cheap material (remember the aforementioned crafts store sets?) 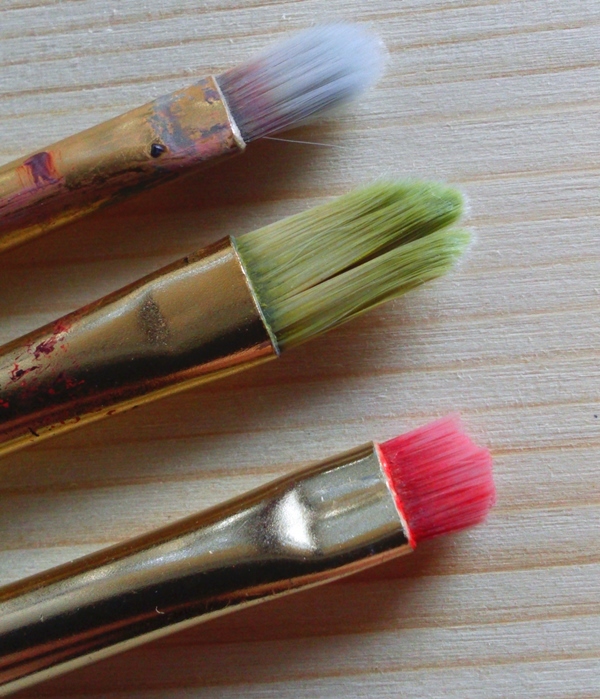 that the bristles – and here I use the term very loosely – absorbed the color of the paint and they cannot be washed. Some bristles wasted away with use. Can you believe the pink and yellow bushes where the same size once? 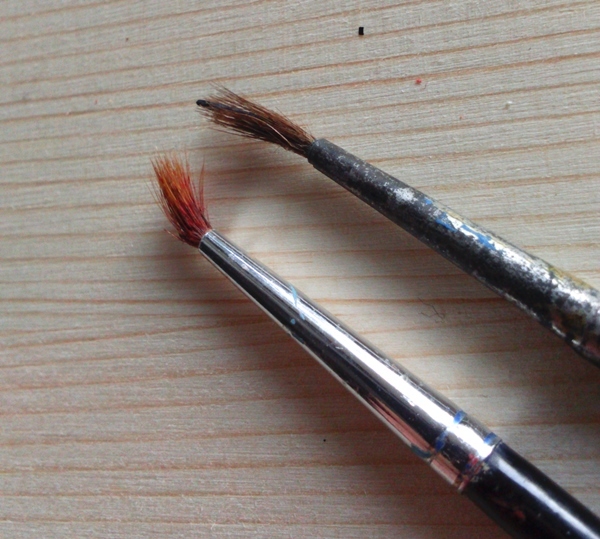 There are a couple of used brushes I inherited from the Hungarian painter Tibor Jankay. For one, I have never used them. And I am just realizing why: they have not been properly cleaned, taken care of in their time and are dried and hard as a rock. 20 years ago I thought that is their natural state. How hard can a brush’s bristle get, you ask? Well, here I am pushing with all my might (hence the blurry picture) on a set of hog bristles which should have a healthy give, but they don’t even move. So, here is what I have found. I have some bushes that are not (and have never been) good for their intended purpose. There are others that with the lack of care have become one mummified version of their once glorious selves. And others that are for techniques that I don’t really care for. So the decision is easy, right: chuck it in the bin! Weeeeeel… the thing is, I become so attached to things, that it is really hard for me to just throw something out. I am convinced this is in part genetic (my maternal granddad was a renowned hoarder and yes, I get it from my Dad as well), in part it comes with age (I am becoming more and more sentimental) and in part utilitarian. I mean, some brushes could still have some use, right!? Case in point, I started experimenting with the use of acrylic gels (more on this in an upcoming post), and harder bristled brushes could leave some really nice marks in it. Yeaaaaahhhhh. You see! This is what I was afraid of: I start out with good intentions, and end up with… OK. I ended up purging the set of watercolor brushes that I had. In all honesty I don’t use watercolors. Second, they were just plain awful. As for the others I will wait just a tidbit longer. I will do my best to use them for some purpose. If not, then (gulp) I will let them go.